Donna is retiring from DSC after 40 years of service. 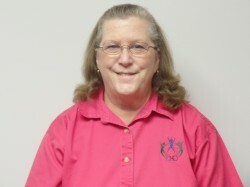 She started her career in March 1977 as a workshop secretary and then supervisor of the front desk, before finally landing in her longtime position as Executive Secretary in 1985. Donna describes her time at DSC as a “great experience” and a “good match” for her. She explains how DSC is a very rewarding place to work because of what we do and who we serve. She mentions how when she first started here, the building was very different and everyone knew each other. Today, because of the number of people we serve and many different location from which services originate, it is a little more difficult to get to know everyone. Some of her favorite memories are the consumer holiday parties and staff outings. In the early years, the holiday meal and the band played in the lunch room, which means things could get a little loud and chaotic, but it was always a lot of fun. Donna is looking forward to no alarm clocks and being able to do what she wants to do at her own pace. She has plans on working on projects around her house, yard work, and spending time with her family. She also wants to focus a little more on a healthier living style.